The bears and the lilacs come out together, they say. 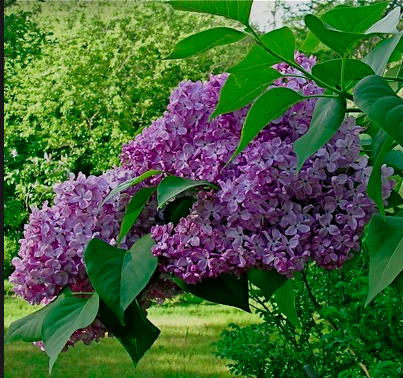 The Lilac Festival began last Saturday. 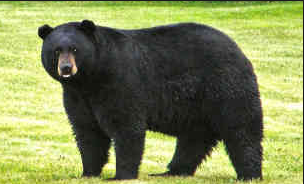 On Friday around 7 p.m. a black bear ambled across the golf course. Diners rushed to the deck to watch it head off toward the wooded Sierra slope. There was no doubt who owned the place. The rest of us were merely guests who had to play by the rules. Garbage goes in a bear-proof safe or directly to the transfer station. Recycling thoroughly washed can go in a locked shed. Grills have to cleaned immediately and well. Food or food wrappers must not be left in a car. (A friend of mine discovered this included corn-based kitty litter the hard way, but at least her bear tidily opened the door, whereas others destroy the car.) Sliding doors and low windows should be closed and locked at night. Always remember that a fed bear is a dead bear. I come from bear country. I saw my first dead bear hanging from a makeshift tripod of logs when I was very small. My father thought that was just what any little girl needed apparently. Certainly he was very excited. My grandmother and I took pots with us when we went for a wilderness walk, banging them together now and then just in case. There were lots of funny stories -funny in the retelling- about bears and pies, and bears and flour and molasses, bears and broken windows… Once my uncles and I, the same age,10 or 12, spotted a bear in the vegetable garden. The men were off haying or something. The boys had 22 rifles, as farm boys often do. Despite Nanny’s protests, they loaded the guns and set off to defend us females. We watched them dodge into the tall corn rows. They were crouching as they went and soon disappeared. The bear had also disappeared. Suddenly one of the boys stood up. One corn row away so did the bear. They were nose to nose. Instantly, both turned and ran, crashing in opposite directions. I was terrified. My grandmother was screaming. Then a minute later, she was holding her sides and laughing. In this Sierra village, some benighted soul filled a tire swing with honey to attract a mother bear and cub. The bear broke into the house next door and vandalized it. The Rangers -the town is in Los Padres National Forest- trapped it in something that looked like a culvert. The bear was not relocated. See above. The lilacs are not so demanding. This entry was posted in humor, nature and tagged bear vandalism, black bear, feeding bears, lilacs, Sierras by joyceahowe/hood. Bookmark the permalink. Lions and tigers and BEARS!!! Oh, my!! Bucket List……number twentytwo……wildlife bear sighting…..CHECK!! In the spirit of not intruding on the wildlife, I refrained from jumping to my feet and so did not actually see the bear.